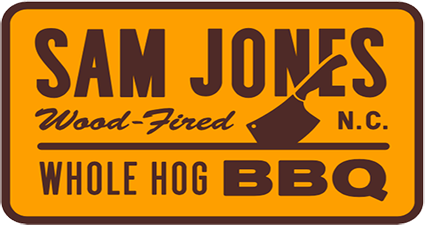 Sam Jones BBQ is rooted in the principles of traditional BBQ. Coming from a long line of BBQ folk, Sam has sparked a new fire in Eastern NC BBQ. While honoring the heritage, you'll find a few new spins on dishes with smoked meats. At Sam Jones BBQ, you'll find a detached smokehouse pumping out fresh food cooked over wood every single day. There are NO FREEZERS. Everything, and we mean everything is made fresh daily. Barbecue is simple. Start with a good product, cook it the way it should be cooked, and you will see the reward for that on a smiling customers face.